Stamping presses can be subdivided into two main types: mechanically driven presses and hydraulically driven presses. The most common mechanical presses use an eccentric drive to move the press’s ram, whereas hydraulic cylinders are used in hydraulic presses. Hydraulic presses are advantageous because they allow for constant press force during the stroke. Prestressed Straight-Side Stamping Presses – Savage Engineering & Sales, Inc. Mechanical stamping presses offer the advantage of being able to reach higher cycles in a shorter amount of time. Electronics, in order to make various housings for electrical devices; industrial manufacturing, in order to fabricate sheet metal into a wide range of machine components and parts; automotive, for use in the manufacturing of parts such as engine mounts, connectors, terminal lead frames; construction, in order to fabricate various household fixtures and safety features; and aerospace, for the manufacturing of diverse structural components as well as internal parts and hardware. A stamping press is comprised of a press frame, a bolster plate and a ram. The bolster plate, also known as a press bed, is a large, non-moving block of metal upon which the bottom portion of a die is clamped. Large presses, used in automotive applications, have a die cushion integrated in the bolster plate to apply blank holder forces. This process is necessary when a single acting press is used for deep drawing. The ram, also a solid piece of metal that is clamped to the top portion of a stamping die, provides the stroke. This action causes the die to produce parts from the metal being fed through it. Typically, the metal is being fed into the press by means of an automatic feeder. Hydraulic stamping presses are able to deliver a controlled force with tonnage ranging from 20 to 10,000 tons, with stroke lengths varying from as small as 10 mm to as large as 800 mm. Additional features of hydraulic stamping presses include adjustable stroke and speed as well as variable tonnage with overload protection. 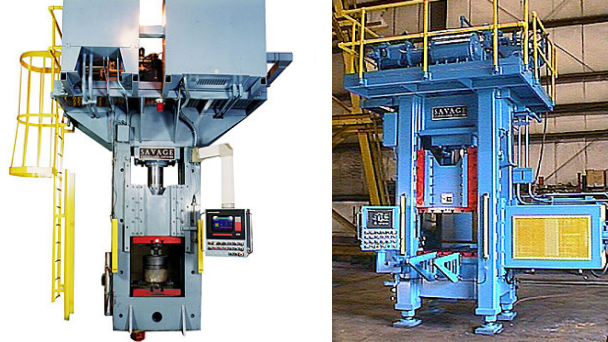 Hydraulic stamping presses are best-suited for the following applications: deep-drawing, low speed high tonnage blanking, compound die action (such as blanking with coining or forming) and force-type forming (instead of displacement-type forming). Stamping Presses >A stamping press is a device that is designed and built to operate progressive stamping dies and other types of dies. Used to shape or cut metal, stamping presses have the ability to fulfill almost any metal forming or stamping need.